Broadway life backstage and live has been bought into cinema halls with chimera of velocity and the credit entirely goes to two mastermind’s cinematographer Emmanuel Lubezki and Mexican Director Alejandro G. Iñárritu. They have used the illusion of cinematic approach to get the right feel of the behavioral prototypes of frenzy Broadway culture. The camera delves continuously without any cuts [advance technology at work] at an impossible protracted endurance capturing every moment of the actors expression and brings the regale atmosphere with traditional cinema frames. Add to the gaiety is the next invincible hero of the film a musician who plays drums for the background score Is also peerless at the moments when vital. Riggan Thomson (Michael Keaton) a washed out Hollywood actor forgotten for his legendary superhero image of Birdman. Now in present attempts to be in vogue by producing and acting in a play, "What We Talk About When We Talk About Love" with host of his co actor Laura (Andrea Riseborough) and first-time Broadway actress Lesley (Naomi Watts) and his daughter Sam (Emma Stone} serves as his assistant, a freak accident at the sets happen to replace actor with none other than a volatile method actor Mike (Edward Norton). As the first previews go disastrously off beam, Riggan blames Mike for stealing the limelight with his own lines. As the day of the final preview comes closer, Riggan sees Sam and Mike flirting, disappointed he accidentally locks himself out of the theater thus leaving his night gown at the door and walks away in his underwear through Times Square to get back inside. This act of his doesn’t go well with a veteran critic Tabitha and promises him to kill his play with bad reviews. The film gives high-quality scope to all the characters to portray their talent with flamboyance with no inhibition left as to prove their brilliance. 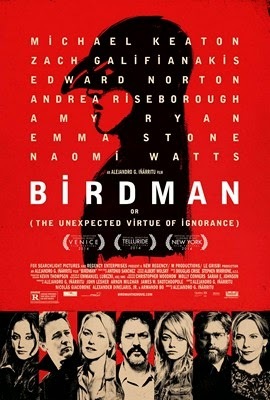 There is no doubt about the Academy Nominations in the different category the film has garnered.